I finally finished the little kit designed by Sharon Perry. I still have to bind it. I finished it on my new octagonal frame from BeeCreek. I really enjoyed using the extra space available on this frame and I enjoyed being able to just turn the frame without having to turn the stand. 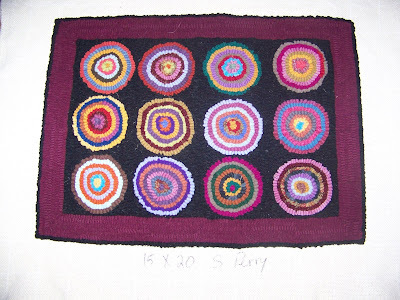 I hooked the last row, the black one, all the way around the rug without taking it off of the frame more than once. 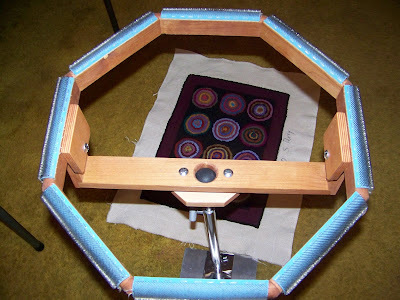 The frame sits on a ball that lets it be rotated and tilted in all directions. There's a ball under the frame at the end of the steel stand. 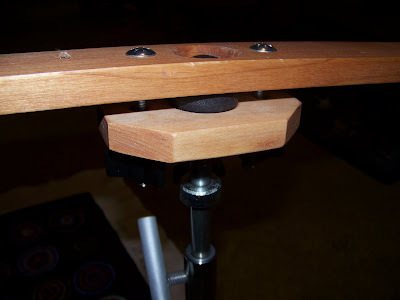 The stand has a steel plate that has just the right balance so the frame is extremely sturdy, but it's not very heavy. 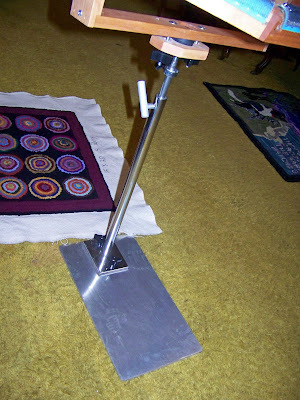 The stand is very adjustable height-wise. The wooden frame around the ball is removable so the frame can be disattached and used as a lap frame - the stand can be taken apart so it would fit nicely in a suitcase. The whole thing arrived in a comparatively small box - that might fit into a large suitcase. 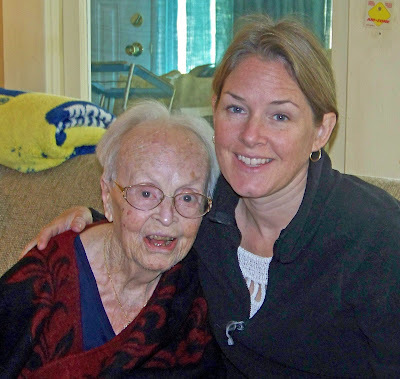 This photo has nothing to do with hooking - but it's one I love - of two of my favorite people - my mother, one week shy of 98 years old, and my amazing niece who lives with her husband and two children in Guatamala - working for the US Center for Disease Control on epidemics like the H1N1 virus. I love the rug! Now the frame is interesting. I love the picture of your mom and neice.. Hug mom for me and tell your neice to keep up the good work!!! Thanks, Loretta! I gave my mom a kiss and told her it was from Loretta - she didn't blink an eye, just said to tell you thankyou!